NOTES: Link and lenght tracks, photo etch. 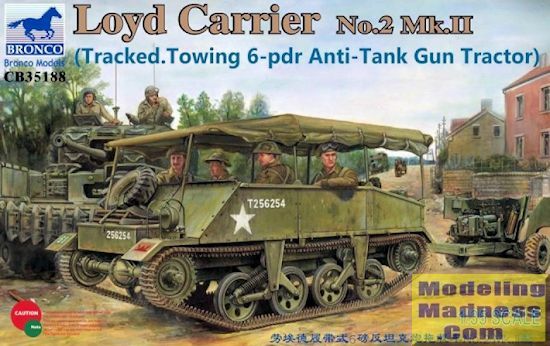 The Loyd Carrier was one of a number of small tracked vehicles used by the British and Commonwealth forces in the Second World War to transport equipment and men about the battlefield. Alongside the Bren, Scout and Machine Gun Carriers, they also moved infantry support weapons. By far the most notable use of the Loyd was in the TT (Tracked Towing) configuration where it pulled the 6 Pdr anti-tank gun from the Normandy landings of 1944 through to the end of the war. There are many wartime photographs of Loyds in action in Normandy, and a number were photographed destroyed in the well-known battle of Villers-Bocage in 1944. The Loyd Carrier was also paired with Caterpillar D8 tractors in service with Royal Electrical and Mechanical Engineers for tank recovery - the Carrier carrying spare equipment for the tractor. The Mk.II differed from the Mk.I basically in having Girling brakes and a 24 stud vs 21 stud Ford flathead V8. 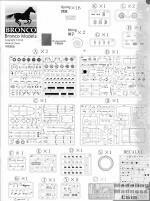 This is another very detailed kit of a relatively small vehicle by Bronco. Like its Universal Carrier and Jeep kits, I can see this one being expanded into several different boxings, including one with the 6pdr gun. To start off with, this is not a curbside. You are provided with a complete flathead Ford V-8 along with its cooling system and transmission. This will eventually fit underneath a cover so those of you who will not be modeling this with the cover removable, can save some construction steps by not installing the upper engine bits as you won't see them. The kit supplies real springs for the suspension bits, just like on their Universal Carrier kit. Nothing looks like springs as do springs so this is a nice detail parts. 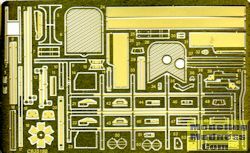 In line with many other Bronco kits, there are bolt heads molded onto the sprue which will need to be cut away and attached to various parts of the kit, including the ends of the suspension cylinders. You are shown what runner they are on and where they go thanks to Bronco adding color to their instructions. Much of the build will be devoted to building up the chassis and the bodywork for this vehicle. This is also where much of the photo etch will be expended. Though some goes with the engine, you'll find all sorts of braces and brackets being made of this stuff, which is also used for radiator screens and exhaust shrouds. Speaking of the engine, there is a seven piece bonnet that goes over the engine and by the look of the parts, you could easily model this with one of the sides open as there is considerable hinge detail on the various bits. The kit relies on link and length for the track system, which makes me wonder why the instructions do not have you glue the idler or sprocket as you certainly cannot move the tracks once in place. There are four crew seats as well as photo etch strapped cargo containers on the inside. Thankfully, Bronco provides a wide range of stores which can be used to fill these areas. You are provided four options when it comes to the top. One is no top at all, another is just the framework, a third is adding the canvas top with rolled up sides and the fourth is having the sides rolled down. You are provided string to duplicate the tiedown straps for the side flap down option. Actually it would be a shame to hide all the work you have to put into the kit by adding the top, but you do have these options which is nice. even markings options are provided with vehicles which are either khaki brown or olive drab. You have the 3rd Carpathian Rifle Division in Italy during mid 1943, 49th (West Riding) Infantry Division in France during June 1944. From September of that year is the Netherland Independent Brigade Group, this vehicle having dark brown areas on the khaki brown exterior. Another vehicle from the same unit in OD is provided asis one from the 15th Scottish Infantry Division in October 1944. The final two are another Netherlands vehicle as well as one from the 53rd Infantry Division in 1944. 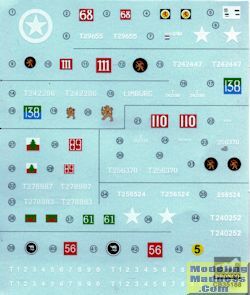 The decal sheet is nicely done and a pretty good size as well. One thing about Bronco is they offer the most detail I have seen in any kit. You sure are left wanting, that is for sure. Though this will be time consuming and will require greater than beginner skills, the end result will be a superb model. Thanks to www.dragonmodelsusa.com for the preview kit. Get this one today at your local retailer.